A recent car accident in Peabody left a teenage driver inside a burning car. According to fire department officials, the accident happened as the young driver lost control of his vehicle and slammed into a home on Herrick Road in Peabody. Both the teen’s vehicle and the home caught fire in the accident, which happened about 2:30 a.m.
Luckily, firefighters were able to rescue the teenager from the burning vehicle. He was taken to Massachusetts General Hospital. 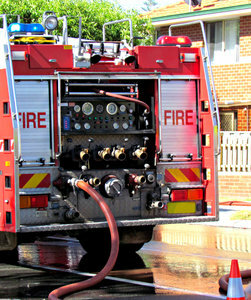 Fire crews were able to put out the fire, both on the vehicle and on the home. Capt. Dale Kimball said that the vehicle was “fully engulfed” in flames. Deputy Fire Chief Paul Lynch said that this accident was one of the worst that he had seen in quite a while. Our Massachusetts car accident attorneys understand the dangers that teenagers face on our roadways. These newly licensed and inexperienced drivers are unable to comprehend the consequences of poor driving habits or risky decisions. Many of these drivers simply overlook the dangers on our roadways and therefor fail to alter their driving habits. Lynch says that his firefighters were eventually able to free the teen through the passenger window. He adds that the rescue team had a difficult time battling through the melting plastic, the flames and the smoke but were able to successfully retrieve the young man. Firefighters were at the scene of the accident for about 2 hours. There was a rollover accident on the other side of the city, forcing crews to split up. After combing the house several times, responders determined that there was no one inside, according to the Peabody Patch. With the holidays approaching quickly, our teen’s risks for car accidents on our roadways will increase significantly. With the holidays comes busy traffic. Visitors and residents will venture throughout the city in route to their holiday destinations. The increase in traffic will heighten your teen’s risks for a potentially fatal accident. Take this time to reiterate the importance of safe driving habits with them to keep them safe through the remainder of the year and beyond. -Make sure your teen always wears a seat belt, regardless of how far they’re driving. -Lead by example. You should always be on your best behavior when driving with your teenager. They’re likely to mimic your driving habits. Be a good role model. -Reiterate that it’s illegal for drivers under the age of 18 to use a cell phone while driving. All drivers are prohibited from texting at the wheel. Enforce the same rules for your household. -Make sure your teen driver is getting plenty of rest. Talk with them about the symptoms and risks of driving while drowsy. -Create and enforce a teen-parent driving contract that lays out the rules and consequences for breaking family driving rules. If you or your young driver has been injured in a car accident in the Greater Boston Area of elsewhere in the state, contact Boston Injury Attorney Jeffrey S. Glassman for a free and confidential appointment to discuss your rights. Call 877-617-5333.